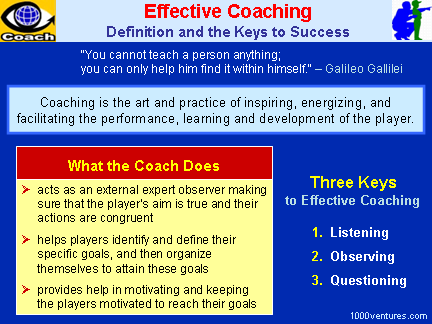 The goal of coaching is to guide vision, urge excellence, and empower the the player. Coaching is all about helping others to identify and define their specific goals, and then organize themselves to attain these goals. Coaching deals with building an individual's personal skills, from setting the goals, to communication to management style to decision making and problem solving.